Burn more calories by increases muscle mass around your body. The best way to boost metabolism in half the time than exercise alone. Why you need to put on muscle. Burning more calories and getting out of the diet red-zone is easy as increasing muscle mass to boost metabolism. The secret to building a diet supportive body is in strengthening your basal metabolism. How do I boost my metabolism natural to lose weight? When you are on a diet trying to lose weight is something you do in the exercise room, but what you might now realize is that your body burns large amount of calories unconsciously whether you go to the gym or not. This is where most of the push comes from when talking about what you need to boost metabolism. The amount of calories burned in your basal metabolic rate far exceeds the calories you burn off during exercise, working out, or any other physical activity. So why not start by working on boosting your basal metabolic rate to effectively increase your metabolism. In this take on Slism, we will discuss boost metabolism tips to improve your diet and exercise success making it easy to maintain weight and lose fat giving you sound support around your health and fitness goals. 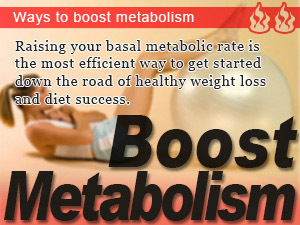 Let's boost our basal metabolism! What Is The Basal Metabolism? You Basal Metabolic Rate, also known as your BMR, are the minimum amount of energy required to support the basic functions of your body. This includes the mass amount of energy used up by your brain to fire neurons signaling all parts of your body, digestion, and other bodily functions. In other words, it the amount of energy required to keep your body on life support. That is, it is energy required in order to perform cardiac beats and body temperature control indispensable in order to live and breathing. Highest teenage basal metabolic rate, then we will continue to decrease as we age. Often hearing "even if I did nothing in old days, I was skinny, but now it becomes easier to grow fat these days", it also seems that this can say as one cause that basal metabolism is decreasing. In other words, because basal metabolism while the decrease with aging, and if do not take measures or control to boost metabolism, would become constitutionally predisposed to gain weight soon. 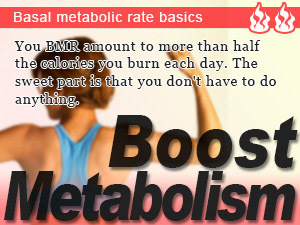 Your Basal Metabolism Rate Makes Up 60% Of The Calories You Burn! What often comes to mind when trying to increase calorie consumption to lose weight while dieting is incorporating exercise to burn more calories. Most people fail to look at the big picture when it comes to increasing calorie consumption. If you want to take a big bite out of the calories you take in, your best bet is to work on increasing your basal metabolic rate for starters. But, just the calories consumed by the activity, there is only 30% of the total daily energy consumption. In fact, the amount of basal metabolism occupies more than halfof total energy expenditure. You can understand quantity of calories-out increases by boost metabolism and that to become easy to get skinny. The best way to increase your basal metabolic rate is simply by increasing the muscle mass on your body. This is thought to be the major reason why your metabolism slows down as you age considering the fact that as you age your muscles mass decreases effectively hitting your metabolism where it hurts hard. Energy is consumed also internal organs, such as the kidney, a brain, liver, as the heart consumes energy by cardiac beats. In fact, the internal organs of the amount of metabolism, such as the heart, are larger than muscles. Since the size of internal organs does not necessarily change according to age, as long as there are no troubles in particular, such as malfunction, it is not affected in the amount of metabolism by aging. But since it fluctuates by aging, the amount of muscles affects the change in the amount of basal metabolism. Your basal metabolic rate and the muscle mass on your body are interrelated. As you increase muscles mass you receive a helping boost in your metabolism. Conversely, if muscle mass decreases so does your metabolism. By the way, has been changing as well as the amount of disgusting fat and muscle mass, due to the low amount of fat metabolism, also increase the amount of fat, has no effect on the energy consumption, unfortunately. The main effects acquired as follows change with kinds of movement. Depending on the type of exercise you do the appreciated effect differs. Here are two types of exercise that you may be familiar with. Unfortunately, for women just looking down to slim down their figure losing weight the approach of increasing muscle mass to boost metabolism in not as attractive. At first glance, the image you get from this approach as you would expect not for women, but if fact the reality is counter-intuitive. As mentioned above, just by training your muscles to increase muscle mass you can boost your metabolism making it easy to maintain your weight all thanks to you basal metabolism. Anaerobic exercise such as weight lifting, plyometric, and running are effective in increase muscular strength as well as tone muscle mass if you are just getting started with your diet where aerobics fail in helping you increase tone muscle mass to boost your metabolism. 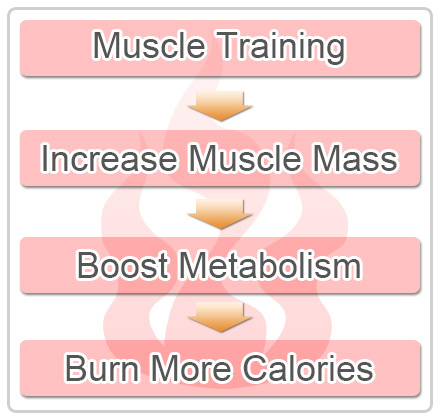 It's possible to increase muscle mass through continued aerobic exercise. Although some people see mixing aerobic exercise with anaerobic exercise as a burden, but in terms of being able to balance your cardio with muscular strength exercises it is ideal. 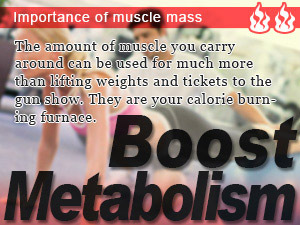 That's it for the first phase of how-to boost metabolism by increasing your muscles mas for today. Stay posted for the next method to boost your metabolism by raising your body temperature in the next Slism take on the Japanese Diet. Raising your basal metabolic rate is the most efficient way to get started down the road of healthy weight loss and diet success. You BMR amount to more than half the calories you burn each day. The sweet part is that you don't have to do anything. The amount of muscle you carry around can be used for much more than lifting weights and tickets to the gun show. They are your calorie burning furnace.